Funky Doodle Donkey: EASTER and the meaning of it. Since we have 3 religions in our family; Catholic, Protestant & Buddhism and we respect all 3 of them, but don't really practice any of them I was looking into the meaning of Easter. Easter is a spring festival that celebrates the central event of the Christian faith: the resurrection of Christ three days after his death by crucifixion. Easter is the oldest Christian holiday and the most important day of the church year. All the Christian movable feasts and the entire liturgical year of worship are arranged around Easter. Easter Sunday is preceded by the season of Lent, a 40-day period of fasting and repentance culminating in Holy Week, and followed by a 50-day Easter Season that stretches from Easter to Pentecost. In Roman Catholicism, and some Lutheran and Anglican churches, Easter is celebrated with a vigil that consists of "the blessing of the new fire (a practice introduced during the early Middle Ages); the lighting of the paschal candle; a service of lessons, called the prophecies; followed by the blessing of the font and baptisms and then the mass of Easter." The traditional customs of the Catholic church are described in detail in the online Catholic Encyclopedia. Over the centuries, these religious observances have been supplemented by popular customs, many of were incorporated from springtime fertility celebrations of European and Middle Eastern pagan religion. Rabbits and eggs, for example, are widely-used pagan symbols for fertility. Christians view the Easter eggs as symbols of joy and celebration (as they were forbidden during the fast of Lent) and of new life and resurrection. A common custom is to hide brightly colored eggs for children to find. But I won't burst their bubble! Let's hide some eggs... I hope our own bunnies won't eat them... haha LOL! Tell me what are your traditions for Easter? What are the foods you are making, any traditional dishes you like to share?? As a child I remember we always would get new 'Sunday' clothes, new clothes for the summer season, but we could only wear them on Sundays... these days my girls have everyday 'Sunday' clothes! OK: so Easter comes from Ostara or Ostera, the goddess of fertility. This goddess has different names in all kinds of ancient pre christian cultures. Her companians are the hare, rabbit(for fertility) as is the egg!!! the start of all life as a symbol; Have nice easter holidays! thanks for some explanation, always nice to learn something too! yes you must always get a new easter dress, or at least an easter dress. We always hid eggs and still do, although I dont' think we ever thought the easter bunny did it becasue it was always done by the adults. I believed in the Easter bunny until 2nd grade when I decided to put a tooth under my pillow without telling anyway as a test because I was sure all of the holidays were a lie, and yes I was very very angry the next day. I used to make my mom hang a sign on my door at night asking the easter bunny to leave the basket outside of my room and to please not come in because it freaked me out, I pictured a man size rabbit in my house like you see at the mall and I was freaked. 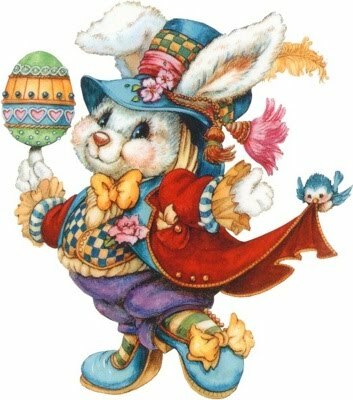 So far I don't really say too much about the easter bunny bringing a basket, I mean I do but I don't go over the top, I know most kids like it but I hated all of it, to me I was being decieved and lied too, but I really think I am the only one like that. So yes Miss Maya will have a basket full of Hello Kitty stuff then go to Joe's side of the family with all her cousins and they always bring more baskets, so no shortage of stuff here. Happy Easter! Becky stopped believing in the Easter bunny about the time she was 8 or 9, but she never let on. When I asked her a couple of years later, why she never told me she knew all along that they he wasn't real she said, "If you don't believe, you won't receive!" She figured if she told me she didn't believe, I'd stop hiding eggs! She still loves to dye hardboiled eggs with Lily even as an almost 18year old. We dye eggs and hide candy at Grandma's house (can't do it at our house--too many dogs). Lily wears her fanciest spring dress even though it's usually freezing outside! We always have a fabulous roast pork meal at my mother's. My mom also always makes a cake in the shape of a cross.